Mick Heath, 53, was at home with his wife Jane, 61, in Bradfield, Essex when about 40 hunting hounds burst into his elderly neighbours’ garden as they chased down a fox. The graphic designer, along with a friend and his teenager son, looked on in horror as a member of the Essex and Suffolk Hunt strolled across the patio before clubbing the fox to death just feet from where they were stood watching. The RSPCA have been informed of the attack and are now understood to investigating whether an offence took place. Mr Heath – who is not opposed to hunting – said “It was totally and utterly barbaric and shocking. “We were at home having a nice, normal weekend when we heard the commotion – voices, horns and the noise of the hounds and they were so close that I threw my three cocker spaniels indoors. “The fox had gone to ground at the end of our neighbours’ garden. The hounds piled in and suddenly the whipmaster of the hunt walked across the patio and clubbed the fox to death in front of us. “My friend Joe, who is an outdoorsy chap who knows the ways of the countryside, turned to him and said ‘you ba**ard”. It is thought that the hunt was using the hounds to try to flush out smaller animals and then use the hawk to make a kill – which is legal under the terms of the Hunting Act. The blood from the kill remained on the shared patio area despite heavy rainfall during the weekend. Mr Heath has accused the hunt of not being in control of the pack of hounds. He said: “All 40 hounds were in the back garden in a tiny area – it was a disgrace and it was so inhumane. “I am certainly not anti-hunt, I have taken my grandchildren to the farm to watch as it is a wonderful spectacle and I have nothing against what they do. “It is the fact that they did this in front of four adults and an impressionable teenage boy in a private garden in Essex. “They could have taken that fox away from our view and shot it – no one should have to witness those events on a Saturday afternoon. The Essex and Suffolk Hunt has denied that the fox was clubbed to death. James Buckle, a senior huntsman, said: “It was a horrible situation where we virtually had to watch and could not intervene. “The fox was killed by the dogs – there is no way that the hounds would do half a job. “I can see how it would have looked like that to a bystander and the would have been horrendous. “The huntmaster was whipping the pack to get the dead fox from them. 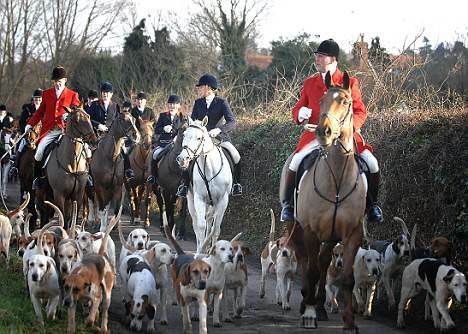 An Essex Police spokesman said: “They were hunting with a bird of prey and the pack accidentally picked up on the scent of a fox which attracted the hounds. “The hunt mistress was spoken to by police.